Title Die Anteile von Meister und Werkstatt. Zum Fall Lucas Cranach d.Ä. Title Herstellung, Grundierung und Rahmung der Holzbildträger in den Werkstätten Lucas Cranachs d.Ä. Title Altärchen von L. Cranach d. Ae. Landgrave Wilhelm II. von Hessen (1468-1509), who was brought up in the court of Duke Eberhards von Württemberg and later became a follower and faithful ally of Emperor Maximilian, was temporarily one of the most powerful rulers in the empire: after the death of his cousin, Wilhelm III (1500), he united Upper Hessen, including the county (Grafschaft) of Katzenelnbogen, with Lower Hessen, the counties Ziegenhain, Nidda, Umstadt; Otzberg and Homburg were also under his rule. As far as domestic policy was concerned he was one of the last landgraves from Hessen to strive for a monastic reform. From his marriage in1500 with Anna von Mecklenburg he had two children: Elizabeth, later the wife of Elector Johann of Saxony, and Philipp (I., Magnanimous). 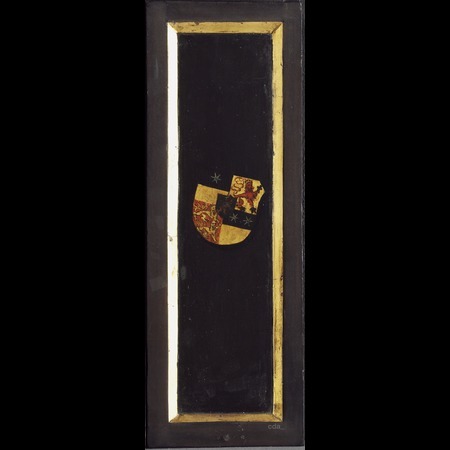 In 1506 the landgrave became ill with syphilis and died on the 11th of July 1509 in his palace in Kassel. During his last three years he conducted an ongoing correspondence with Elector Friedrich the Wise from Saxony. It is probably through him that the contact to Lucas Cranach came about. Wilhelm II. may have commissioned the altarpiece while still alive as he anticipated death from the outbreak of the disease. However according to Bernhard Schneckenburg it was probably not created until after his death and can therefore be viewed as a epitaph-altar. In this case it would have been commissioned by Anna von Mecklenburg, who reinforced her alliance to the Hessen House with the altarpiece. It represents the first verifiable commission for the court painter from another dynasty. 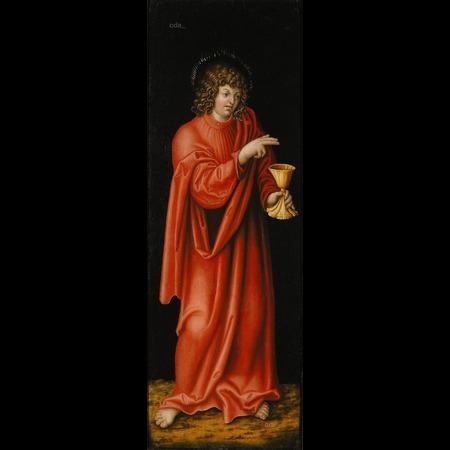 According to the Gospels of Mark (16, 1-6) and Luke (24, 1-6) Mary Magdalene, Mary of Clopas and Mary Salome went early on Sunday morning to Christ’s tomb with spices and ointments. However when they arrived there the tomb was empty and they learnt that Christ had risen. 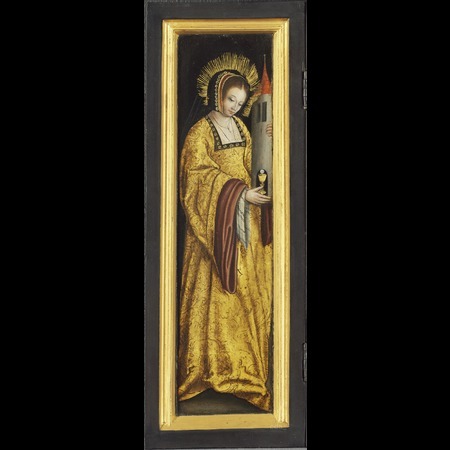 The style of the triptych in Kassel is close to that of the so-called Torgau Princes Altar (also known as the Altarpiece of the Holy Kindred or Anna Altar) (Frankfurt a. M., Städelsches Kunstinstitut; dated 1509), which according to [Friedländer, Rosenberg 1932] was commissioned in 1505. Both altarpieces are characterized by a clear and simple composition that is orientated around the middle axis but apparently avoids symmetry. Just as the figure of Christ opposite Sts Barbara and Catharine is positioned slightly further within the pictorial space, the same is true of the group with Mary and Anna opposite Mary of Clopas and Mary Salome on the wing panels. The spatial rhythm of the central panels can also be compared with regards the opening of the pictorial space into the background – also the landscape on the painting in Kassel and the back wall of the chamber of the painting in Frankfurt can be compared. The posture of the watchman sleeping in the foreground on the left, who supports his head in his hands, is similar to the sleeping Joseph to the left of the central group. In addition the landscape on the Resurrection Altar is similar to that on the right wing of the Anna Altar with respect to the wafting wisps of cloud and bare branches stretching into the sky. 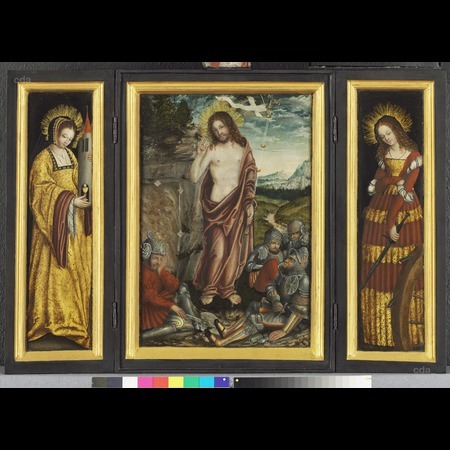 The balanced composition of the Resurrection Altar suggests points of contact with the Italian Renaissance, which were indirectly conveyed to Cranach through netherlandish painting (Quentin Massys). Furthermore he used an engraving by Jacopo de Barbari as a prototype for the figure of the risen Christ. The motif of the closed rock tomb is a feature of netherlandish painting, for example already in works by Gerard David. 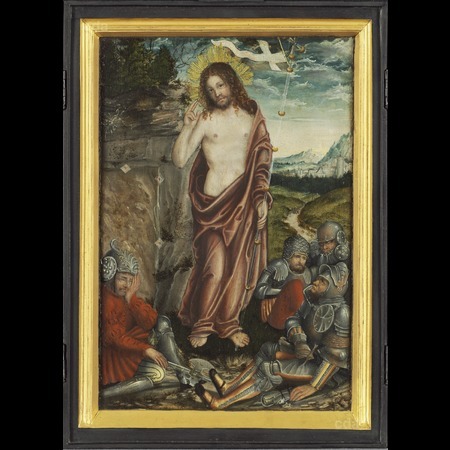 The Resurrection Altar is attributed to Lucas Cranach the Elder. [Friedländer, Rosenberg 1932] summed it up as 'the stiff folds in Christ’s robe, the weak hands among others give rise to doubts on the authorship. However due to its early date of production they neither attributed it to the workshop nor did they consider its participation. But according to records Cranach employed assistants as early as 1507. The involvement of assistants in the production of the domestic altar in Kassel can therefore not be excluded. On the one hand the infrared reflectogram of the central panel reveals a lively underdrawing, showing an in part dotted, in part curvy ductus, which appears to be autograph and is for example very similar to the 'Crowning of Thorns' (Kunstsammlungen zu Weimar, about 1515/20). Glaser highlighted the resonance of 'leonardesque' design in the figure of the risen Christ. The hand raised in an attitude of blessing is accurately outlined, and the modelling of the torso is particularly subtle. The landscape also distinguishes itself in the upper layers with a richly nuanced painterly quality and a subtle representation of light and movement. On the other hand a comparison with the so-called Torgau Princes Altar confirms the weaknesses observed by Friedländer/Rosenberg. The hands of St Barbara, the watchman in the foreground on the left or the left hand of Christ lack articulation. They remain stiff and flat with fingers that only bend in parallel instead of gripping. In contrast on the so-called Torgau Princes Altar particular attention is paid to the hands and the shape of the fingers. 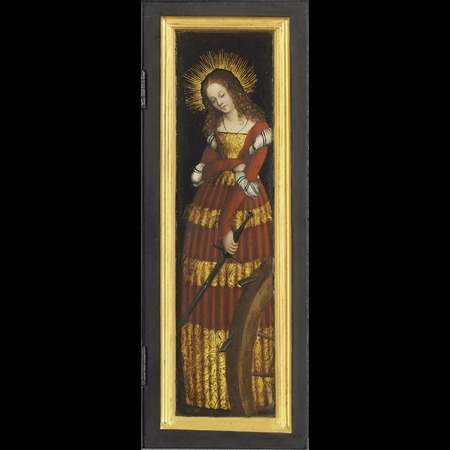 The arrangement of the folds in St Barbara’s dress lack both volume and comprehensive sweeping lines in comparison with the cloak of St Alphaeus on the left wing panel of the Anna Altar. It is therefore conceivable that an assistant was involved in the execution of these details, more so if the triptych was produced about 1509. It was precisely in the year 1509 that work in the Cranach workshop increased. In addition to the large Princes Altar, the Venus and Cupid (Leningrad, Staatliche Eremitage), the Portrait of Dr. Christoph Scheurl (Private collection) and Georg Spalatin (1933, Berlin, Smlg. Baronin v. Lipperheide) were produced. As well as these a plethora of large woodcuts were executed in the year 1509, among others three tournament representations with many figures, fourteen sheets illustrating the Passion of Christ, and the woodcut illustrations for the Wittenberg Heiligtumsbuch - a labour-intensive climax within Cranach’s graphic work. Nevertheless the characteristic quality of an autographed execution prevails in the Kassel Resurrection Altar. These observations show how closely linked Cranach’s altar for Kassel was with his production for Friedrich the Wise of Saxony in Wittenberg and begs the question whether the work could have been a gift from the elector to his ailing friend, the landgrave Wilhelm II, intended to offer solace and hope of resurrection. It is also conceivable that it was a gift from the Wittenberg court to his widow Anna of Mecklenburg. However when one considers the dispute between Friedrich the Wise of Saxony and landgravine Anna immediately following Wilhelm’s death with regards the guardianship of the five year old Philipp it does not seem very likely. Nor is a commission from the Hessian court likely as since the outbreak of his illness Wilhelm had lived in almost complete isolation. Besides the Hessian coat-of-arms has been inverted. This could be due to a desired symmetrical arrangement; however the Mecklenburg coat-of-arms is shown the right way around. The difficultly of reproducing it correctly is illustrated by the coat-of-arms of the landgrave Philipp the Magnanimous of Hessen from 1546, which was created within the context of the Schmalkaldic War and commissioned by Elector Johann Friedrich the Magnanimous of Saxony (Cat. No.109). No underdrawing was detected on the wing panels. 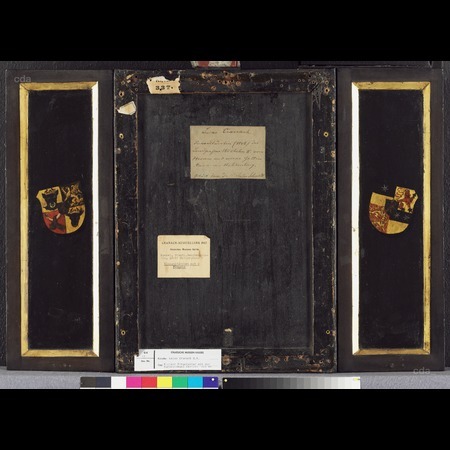 Recto: The haloes of Christ and the angels were executed with a matt application of gold leaf and the contours of the rays were outlined in black paint. A matt application of gold leaf was also used for the chalice held by St Barbara and for the saints garments. The pattern on the robes was painted over this.